The inside-outside lifestyle is what Dar Sayang is all about with outside chill-out spaces and large modern entertaining space indoors. There are floor to ceiling windows in all of the rooms flooding the villa with light.Inside and outside sound systems allow you to listen to your music throughout the villa and the pool area which has chill-out areas with a very relaxed vibe.The villa is heated and air-conditioned and there's a working fireplace in the living room and in each of the five suites making them really cosy on cooler evenings. There's also a large open plan dining room and separate TV room. The security-conscious will be pleased to know there's an electronic safe in each room and the villa has an alarm system.There's a TV in each room and high-speed WiFi throughout the villa. The architect Imaad Rahmouni has created a family house with contemporary, clean lines that has stunning views of the Atlas and its snow-covered peaks. The villa provides all the hotel services of a luxury hotel and sleeps up to 10 people in 5 large rooms (3 on the ground floor and 2 upstairs), on a sumptuous site of one hectare, with one inside and one outside heated swimming pool. Dar Sayang is a stunning, spacious modern villa with pool and tennis court just outside Marrakech, 10 minutes from the medina. Ideal for a relaxed holiday with friends and family, it has five bedrooms, sleeping up to ten people in the lap of luxury. Unlike many luxury villas, you can take over Dar Sayang for as little as two nights. A stay here includes your very own team of staff including a chef, maid, gardeners, security guard and parking valet if needed. The outdoor swimming pool has a whirlpool bath fitted and there's also an indoor pool and gym. The library and private terraces around the villa give everyone their own space to relax and unwind. A massage therapist can be booked in for a treatment in the spa treatment room. The in-house chef will cook your meals on demand throughout your stay. Of course, if you prefer to cook yourself that's fine too! The inside-outside lifestyle is what Dar Sayang is all about with outside chill-out spaces and large modern entertaining space indoors. There are floor to ceiling windows in all of the rooms flooding the villa with light. Inside and outside sound systems allow you to listen to your music throughout the villa and the pool area which has chill-out areas with a very relaxed vibe. 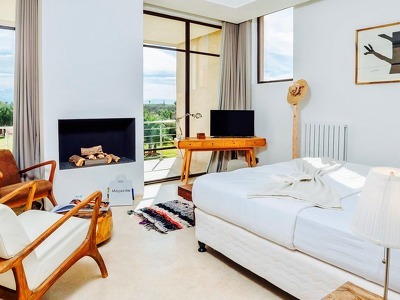 The villa is heated and air-conditioned and there's a working fireplace in the living room and in each of the five suites making them really cosy on cooler evenings. There's also a large open plan dining room and separate TV room. The security-conscious will be pleased to know there's an electronic safe in each room and the villa has an alarm system. There's a TV in each room and high-speed WiFi throughout the villa.